Obtaining valuable feedback from your participants after an event is crucial to planning for future events! You need to know what worked so you can replicate it… and what didn’t go so well so you don’t repeat it. How do you get data from your participants that you can actually use? Create a post-event survey with questions that will give you information you can take action on! Only ask about things you know you can change that will truly improve your event. Is this the first time you’ve attended our event? What part of the event did you like best? What could have made your experience better? Was the event too short, too long, or the right amount of time? How would you rate the location? ** Any suggestions for a better one? How likely are you to recommend this event to someone? *Thanks to Kivi Leroux Miller and her great interactive session at Bloomcon! Don’t know which service to use to set up your survey? Check out this comprehensive list! Make sure you state the purpose of the survey before asking questions. 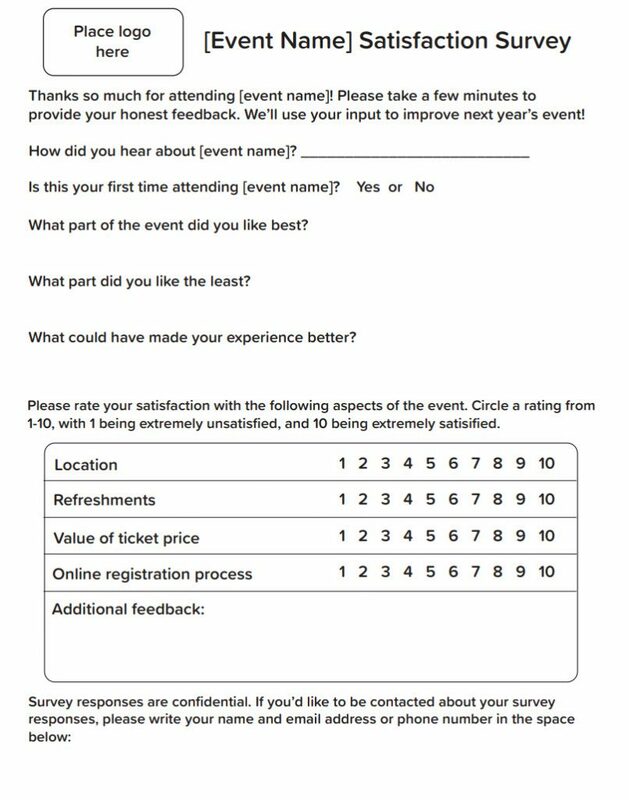 Let attendees know you want their HONEST feedback so that you can act on it to improve future events and make their experiences better! Provide clear instructions. For example, if you’re providing a like/rating scale, be sure to explain if 1 or 10 is the most favorable. You’d be surprised how many people mix these up. Send your survey promptly; the same day as the event is ideal. People start forgetting what happened if you wait too long, so strike while the iron is hot. You can use a service such as Campaign Monitor or MailChimp to schedule the delivery of your survey via email. Set it up beforehand and you won’t have to worry about remembering to send it while cleaning up and getting everything back in order after your event! Consider asking for some demographic information. This can help you determine which age groups, genders, etc. your event appealed to. You might be surprised to find that your event wasn’t as inclusive as you thought! Let participants know that survey results are confidential! You can provide an optional slot for name and contact if the participant wishes to receive follow-up communication. Definitely follow up with anyone who left less-than-favorable feedback! Don’t ask long, complex questions. Keep it simple. Don’t ask too many questions. We have short attention spans. Try taking the survey yourself to see how long it takes. If it’s more than a few minutes, make some changes! Let participants know that you’ll share any planned changes, and let them know when to expect that follow-up. Make sure you follow through and email any changes that were a result of feedback for next year’s event. Seeing their suggestions in action will make them feel valued and increase their loyalty! If you decide to have participants fill out a paper survey on-site before they leave, you can customize the attached template to meet your organization’s needs. Click the image below to download a PDF template you can edit. Remember, only ask questions that you can and will act on! If you ask a bunch of questions that don’t really matter and have no intention of changing anything, it’s a huge waste of resources. If you ask about what matters and use the information gained to make your event better, your participants will keep coming back year after year (and hopefully bring friends! ).